With IEEE 802.11ac, the new standard for wireless local networks, a further increase is to be expected for WiFi applications. This WLAN “Wave2” enables data rates of up to 7 Gigabits per second. Are we soon going to reach the point where we no longer require fixed cabling in offices? No, because even WLAN access points are usually connected using structured cabling. In the case of modern WLAN products (compliant with IEEE 802.11ac), the data rate required on the cable side is more than 1 Gbit/s. 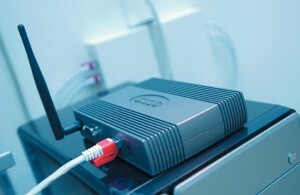 Access points therefore have to be connected either with several 1000BASE-T ports, resulting in an increased amount of cabling, or with one 10GBASE-T connection. The planned transmission technology NBASE-T, which enables 2.5 or 5 Gbit/s over existing Cat. 5 and Cat. 6 cabling, is a possible interim solution. But this is hardly going to be enough long term. Capacity-based WLAN planning common today features lots of small radio cells. They are operated with correspondingly low performance to prevent interference with adjacent cells and to ensure a high data rate per subscriber. 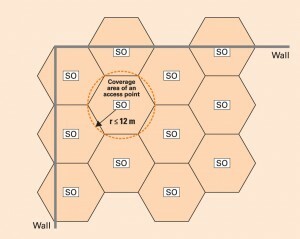 The honeycomb radius of 12 meters prescribed in the standard, or rather the resulting distance between access points of 21 meters, has to be viewed as outdated. Today WLAN manufacturers are issuing recommendations for the distance between access points in the workplace of 14 meters (honeycomb radius: 8 m). With those figures likely to decrease. Honeycomb structure compliant with EN 50173-6, Amendment B. SO = service outlet. The coverage radius of a radio cell will be considerably less than twelve meters in future. Degree of coverage of a single radio cell. For the workplace directly under the access point, the field strength relations are perfect to guarantee a maximum data rate. The many workplaces with mediocre field strength relations slow down data throughput. Cabling compliant with the honeycomb structure presented in EN 50173-6, Amendment B, is successful in this respect. What is crucial in deciding the future effectiveness of this cabling is choosing the correct honeycomb radius which is relative to the cell size of the WLAN. Alongside the changes in technology, influencing factors, such as the concentration of workstations and changes in use, have to be taken into consideration. This is why it is important to plan installations long term.